Mangos are in season and here's a great way to use them. This cream cheese crust is perfect for the pie crust impaired, of which I'm one. I tend to steer clear of having to roll out dough, but this one is different. It's very easy to work with and delicious. Caramelizing the mangos intensifies their flavor and the pecan crumb topping not only compliments the mangos, it also adds the finishing touch to this dessert. To make the dough, measure the flour, baking powder and 1/2 teaspoon salt into a food processor. Add the butter and the cream cheese. Attach lid and pulse 6 or 7 times (1 second pulses), until mixture looks like coarse crumbs. Uncover and evenly drizzle vinegar and water over flour mixture. Attach lid and pulse about 6 times until mixture begins to clump together—it won’t form a ball. Uncover and turn dough out onto a lightly floured surface and form into a ball. Divide the dough into 6 equal pieces and form a flat disk with each piece. Cover with plastic wrap and refrigerate for 1 hour. To make the filling, heat a large (12-inch) non-stick skillet over medium-high heat and melt the butter. When it begins to brown, add the mangos. Stir frequently for a couple of minutes until the fruit releases its juice. Sprinkle the sugar over the mango and continue stirring frequently until all the liquid has evaporated and the mango has begun to caramelize, about 5 minutes. Cool. To form the tarts, roll out each disk into a 6-inch circle. Place an equal portion of the cooled mangos into the center of each circle, leaving a 1-inch border. Fold in the border of dough over the outer edge of the mangos, pleating it all the way around the filling, leaving the center open. 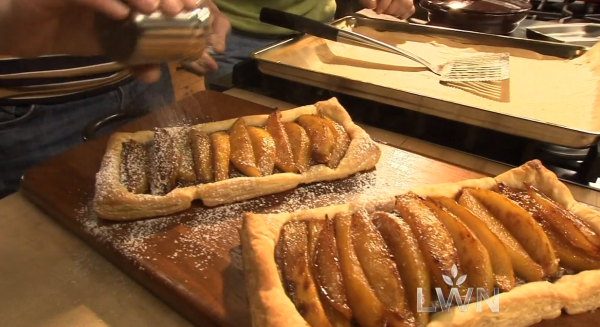 Transfer the tarts to a parchment lined rimmed baking sheet. Combine the ingredients for the crumb topping in a small bowl. Using a fork or your fingers, mix until the topping starts to form clumps that hold together. Top each of the tarts with this mixture. Place the baking sheet into the preheated oven and bake for 25 to 30 minutes or until the crust is golden brown. Serve warm with a dollop of whipped cream. Jill's Wine Recommendation: This tart pairs well with the 2007 Jorge Ordoñez Selección Especial #1 from Málaga, Spain, which is 100% Moscatel. The floral elements of this wine match the rich honeyed notes in the mango without being overpowering.